A solo exhibition at The Sir Harold Hillier Gardens is planned for September / October 2020, to launch her new book, The Whole Story. the Botanical Art Worldwide exhibition in the UK. Common British Corticolous Lichens and was awarded her sixth Gold Medal. See ‘Lower Plants’ gallery page for a couple of the paintings from that exhibit! A major shared exhibition at The Hillier Gardens 28 September – 7 October 2018 to launch Christina’s next book. 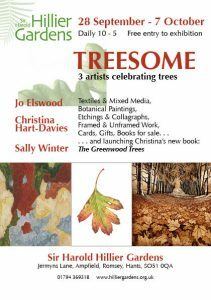 TREESOME was shared with Jo Elswood (textiles and mixed media) and Sally Winter (etchings and collagraphs), and featured images of trees in an exciting variety of media. Medici Gallery, London; Spring Hill Gallery, Brisbane (solo); Creative 92 Gallery, Toowoomba, Queensland (solo); Young Masters Gallery, Brisbane (solo, 2-person); Peter Hedley Gallery, Wareham, Dorset (2-person, 4-person); Chris Beetles/ Countrylife Gallery, London; World Orchid Conference, Glasgow; Royal Horticultural Society, London; Kew Gallery, Royal Botanic Gardens, Kew (3-person); Sir Harold Hillier Gardens (4-person, solo, three-person). Royal Institute of Painters in Watercolour, Mall Galleries, London; Contemporary British Watercolours, Bankside Gallery, London; Paris Salon; ‘Flowers and Gardens’ (Society of Botanical Artists), Westminster Gallery, London – annually 1984-2004. Hunt Institute for Botanical Documentation, Carnegie-Mellon University, Pittsburgh, USA (7th International Exhibition); The Shirley Sherwood Gallery, Royal Botanic Gardens, Kew. Christina shows regularly with groups such as the Society of Botanical Artists; South West Society of Botanical Artists; Dorset Art Weeks (occasionally). She showed regularly with the Society of Floral Painters before its closure in 2016, and with Florumin Kent before it too closed.